Book of the Month for October – Hooray For Fish! It’s finally spring time – which means it’s nearly beach time! In anticipation of the return of warmer weather, our book of the month for October is a celebration of the wonderful world of FISH! Hooray for Fish! 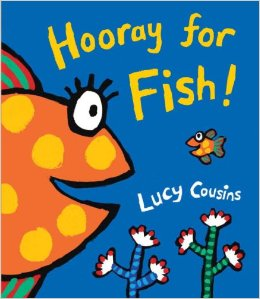 by Lucy Cousins is a vibrant and colourful rhyming story that takes children on a journey under the sea. There are big fish and small fish, spotty fish and stripy fish, jelly fish and elefish! All sorts of fish splash and swim through the pages of this book in a glorious celebration of all things fishy! Learn about adjectives (describing words) which are plentiful in this story! For younger children you can describe the fish on each page as you red the story and older children would enjoy finding a fish you describe for them – see if they can pick which one you are talking about! Then give your child a turn to describe one for you. Print out a picture of a fish on a big piece of paper and use circles of coloured paper to stick the scales on a fish. While you are doing this talk about the colours and shapes of the scales you are using. Go on a listening walk to the beach and see what sounds you can hear. Talk to your children about the sounds, imitate them and see if you can work out where they coming from or who/what is making them! Collect some treasures from the beach and make a ‘beach in a bottle’ by putting some sand and shells inside a bottle. Then fill it with water and stick colourful fish stickers on the outside. Talk about what you’re doing as you make your ‘beach in a bottle’ or practice following instructions (you give them to your child or your child can give them to you). Sing some songs about fish. My favourites include, ‘Slippery Fish’, ‘Down in the Meadow’ and ‘All the Fish are Swimming in the Water’. For little listeners, use your voice to acoustically highlight the ‘f’ and ‘sh’ sounds in the word ‘fish’. You can listen to the sounds ‘swish swish’ and ‘splash splash’ while playing with sea animals in a tub of water.